I’m glad you’re here. In the spirit of the time of year, I want to offer a gift, mixed with a challenge. This idea is founded by Will Bowen of www.acomplaintfreeworld.org, details below. The reason for this gift is that there continues to be more and more evidence to connect our thoughts, statements, actions and feelings to our overall experience of the world. This challenge offers the opportunity to consider our statements, if only for three weeks. Basically, no complaining. One strategy in tackling this seemingly insurmountable task, is practicing gratitude. We all have much be thankful for. Ok, I’ll start. In this card you’ll find a few reasons why I am grateful to have you in my life. I hope you find this gift intriguing and interesting enough to experiment with. The paragraph above was the beginning of a card I wrote for about 20 members of my family as well as some other loved ones over a holiday season. I wanted to take the opportunity to give back some gratitude and a chance to put some intention into action for the New Year. I learned about this through A Complaint Free World, here is a video that is worth a watch about this project. 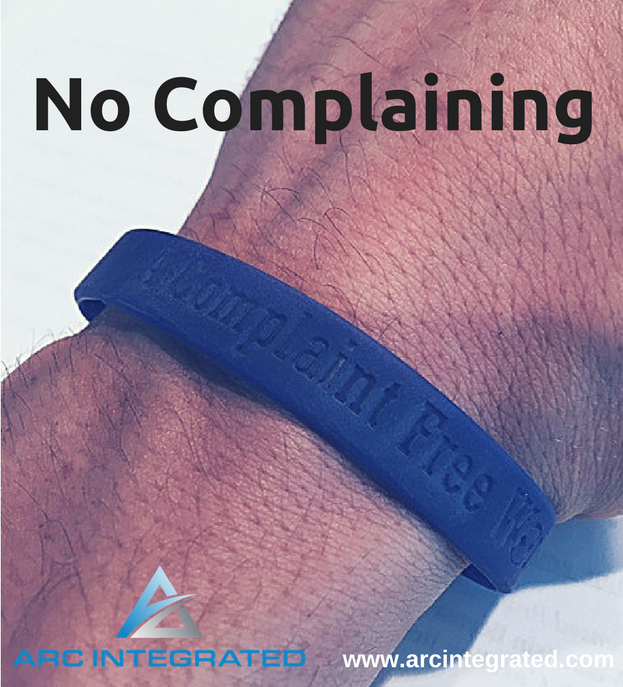 The basic idea is that you get a bracelet that stays on your wrist until you can sustain 21 days without complaining. Every complaint means you switch wrists and the timer starts over. According the website, they say that this experiment typically takes 4-10 months to complete! What a great opportunity to challenge ourselves! We often hear about studies on changing our mindset, practicing mindfulness, being positive or other non-tangible pieces of advice. While I am totally on board with the previous suggestions, I like this 21 day challenge because it has an activity attached to it, which I think helps to build the likelihood for success. Whenever we are practicing a new way of thinking or feeling, there should be an associated new way of being or doing. I was really thankful for my family’s response to this gift as it seemed very heartfelt and appreciative. There were some tears shed, lots of joking and I think some added thoughtfulness about our individual attitudes and statements, which was my hope. However, I don’t think that just passing out bracelets and offering the challenge would have been as meaningful without the added gratitude. With every bracelet I gave I wrote a personalized note regarding why I was thankful to have each person in my life. I believe that expressing gratitude as a part of this gesture was important because it was an example of how to pursue the task of – no complaining. If you are reading this blog, then you most likely have everything you need. You have shelter, food/water and probably some people in your life that you care about or care about you. There is much to be grateful for. Expressing gratitude is one strategy in combating the pattern of complaining. Care to experiment? The next time you notice yourself complaining, see how this could be shifted into a statement of gratitude. Alternatively, practice expressing gratitude more often and see if that shifts how much you are complaining. Wishing you a prosperous, fun, challenging and growth filled year ahead! P.S. If you are curious to learn more about personal development, effective workplace culture, dynamic leadership and a wide variety of other topics, sign up today! www.arcintegrated.com/book. It’s totally free. You’ll also receive Chapter One (for FREE) from the upcoming book – CHANGES. This book explores seven themes of sustainable change so that you can finally achieve the professional and personal goals you have been striving for but keep missing. 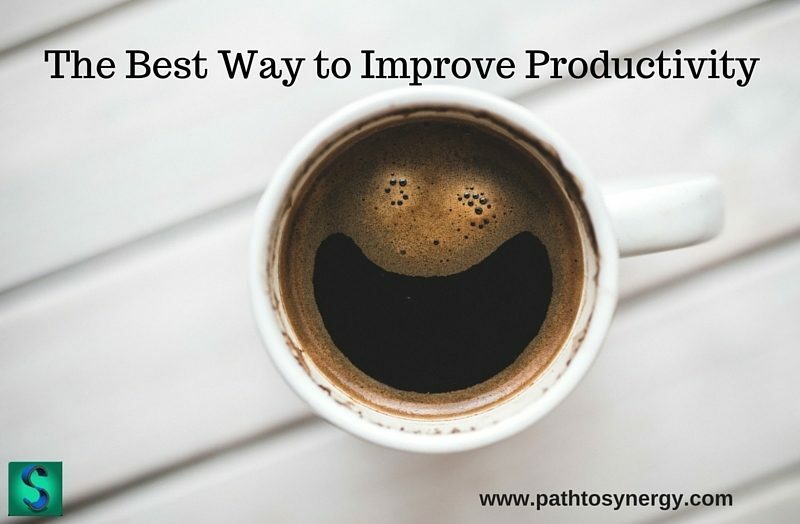 There are an endless amount of resources out there for how to improve productivity. In my search I did not find a definitive answer to the best way to improve productivity. I think there is an answer to this question though. The best way to improve productivity….is your way. Finding out ways to hack your own laziness, distraction or “busy” lifestyle is tricky. But the most effective way to improve productivity will be the one that is most connected to you. A place to start when identifying what kinds of practices to experiment with may be the endless lists online, such as this one on – boosting productivity in real life. As you may notice, I even wrote one of these tips. The tips and strategies are definitely good to start with. Experimentation and practice is where the rubber hits the road. The next step is exploring the strategies in a way that answers the question of – how does those strategy resonate with me? Using strategies that are most connected to who you are will yield the best results. There are certainly some exercises and strategies that are more about self-exploration than others. Here is a short list of strategies that may help to improve productivity, but more importantly offer the opportunity to explore what’s holding you back, and who you are. This may seem counter intuitive since taking a vacation is not necessarily the most “productive” of activities. However, letting go of some of the demands and hustle for a few days can help you to re-identify what is truly important, as well as give you a boost of energy when you return. When looking at habits and common traits of successful people, one thing is usually consistent, they have some sort of regular practice. Having a daily practice helps to create mindfulness, discipline and routine – all things that impact productivity. Similar to the daily practice, focusing on ways to practice discipline can help to build routine and productivity in many areas in life. Discipline can be practiced in a number of ways through fitness, healthy eating, work duties, behavior in relationships, self-reflection and many other aspects in life. The practice of the discipline itself may be just as important as the goal related to it. You may have heard the recent commentary about sitting being the new smoking. There is substantial research to back up the idea of sedentary lifestyle greatly impacting health, wellbeing and productivity. Exploring ways that help you to enjoy regular daily movement will make these little breaks easier to commit to and more likely to stick. Again, this is about personal exploration of what works for you. What would I love to do every day if I had an unlimited amount of money? If I had unlimited resources and I could only do one thing to help the world, what would it be? How have you enhanced your own productivity? Discipline has been on my mind lots in the last few weeks, so I thought I would do some exploring. I am currently experimenting with a month long restricted diet (Whole30), definitely an act of discipline. However, not in a bad way. Most of the time when I explore ways of eating, exercise routines or other practices I find it interesting and at least somewhat eye opening in some way. Usually I find that there are discoveries to be found when pursuing an act of growing self-discipline. I found that it my life, practicing martial arts has been a continually evolving way to build self-discipline. 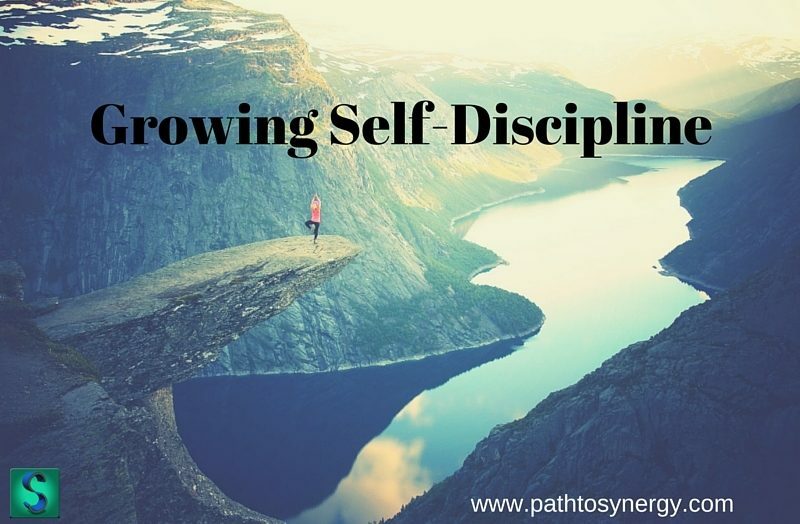 Certainly there are many ways to build self-discipline, but the question may be – why? There are many findings on the impact of self-discipline across many aspects of the human experience. The advantages of having good discipline start when are young. In a longitudinal study by The Positive Psychology Center at the University of Pennsylvania found that self-discipline accounted for twice as much variance as IQ in final grades of eight grade students. These habits and their results may have significant impact on children’s ability to be successful later in life. A study in The Journal of Applied Developmental Psychology showed that implementing a school based martial arts program had a positive impact on children’s cognitive self-regulation, an aspect of self-discipline. According to Alphie Kohn it may be more valuable for children to be able to build the capacity to choose when to exercise self-discipline as well as what kind of self-discipline, and that this ability to choose may be more valuable than the self-discipline itself. However the impact of discipline is not just found in kids. In a study by The Department of Psychology, Washington University in St. Louis, MO it was found that enhancing self-discipline and self-concept may improve subjective memory in older adults. According to a study in The Journal of Depression and Anxiety, low self-discipline has been associated with anxiety and depressive disorders. Take your time – Building any new habit takes time. Taking small steps slowly over time will great the greatest recipe for success. Remember that creating significant change is a process. SMART goals – Goals that are Specific, Measurable, Attainable, Realistic and Timely will be the easiest to keep track of and the most likely to be achieved, leading to greater confidence and success overall. Find your practice – Building self-discipline, will be most effective if the practice is something that you really enjoy doing. Finding a practice within the category that you are trying to create discipline around will help to build momentum and success overall. You may find that creating discipline that is at least somewhat connected to your purpose or passion will be easiest. Record your process – Explore the ups and downs of what it is like to create a new discipline in your life. This will be helpful in examining what works, what doesn’t and accomplishments along the way. Practice creating routine – Practicing some kind of routine, even if it is outside the context of your goal will help in building the mindset of being more self-disciplined. There are always opportunities to create new routines every day, take advantage of this. How have you created self-discipline in your life? Beat the Post Vacation Slump!